“Mr Standfast” is a spy novel featuring Richard Hannay, written by John Buchan and published in 1919 by Hodder & Stoughton. 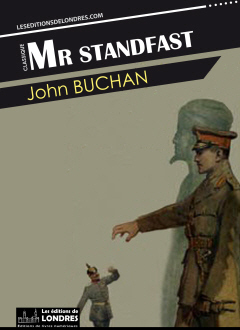 “Mr Standfast” is the third of a series of five novels by John Buchan spanning a period of twenty years. The first and most famous, The thirty nine steps, published in 1915, is set just before the war. The second one, Greenmantle, published in 1916, takes place during the war. So does “Mr Standfast”, unlike the last two, “The three hostages”, published in 1924, and “The island of sheep”, published in 1936. The novel owes its title to a character of John Bunyan's “Pilgrim's Progress”. Richard Hannay is recalled from the Western Front by his good friend Bullivant in order to be assigned a new mission. As always, the whole action revolves around identifying a master German spy who operates in Britain along with his agents. In order to find him out, he must adopt a disguise he truly dislikes, the one of a pacifist. He then travels to the Cotswolds as Cornelius Brand, a South African war objector, in order to penetrate a group of war-hating intellectuals. He falls in love with a young woman called Mary who is also part of the group. He then travels to Glasgow, gets into trouble, and goes off to the Isle of Skye and to Ranna. He is then off to the European front again and finally to Switzerland. There he must uncover the final act of the drama playing out before him. He identifies the German spy as Otto von Schwabing, whom he recognises from The thirty nine steps. He is made prisoner by the ruthless German spy but manages to escape, after which, thanks to his friend Pienaar and his talent for improvisation and deciphering coded messages, he manages to save Europe from a German attack. The war is coming to an end. But Richard Hannay is not done yet. Buchan is clearly trying to evolve whilst developing his character. The result is mixed. A lot of the action is centered around what Hannay does and thinks, how he reacts to adversity and how he deals with strangers. The scenes are long, the mental path that Hannay covers is described in detail. One could argue that Buchan's novels, because of their one-minded plot and cinematographic sequencing, had a major influence on the cinema master himself. “Mr Standfast” does not either have the strong plot idea of Greenmantle. It is an attempt at another The thirty nine steps but without the same freshness. Still it is a good read. Hannay is an even richer character at the end of his third adventure. In many ways he is an inspiration to both Ian Flemming's James Bond (patriotic statements, fights, dark little coves in the night, sudden friendships, man's man, hard drinking, facing enemies with grand plots to shake up the world, story sequenced in locations...), and John Le Carré's heroes too (detail of spy stuff, war as a main theater, deciphering, secret codes, strange secret service relationships, absence of glamour, somberness...). John Buchan is the inventor of the modern British spy novel.